So, I’ve been doing some pretty cool stuff at 826LA! Never heard of it? 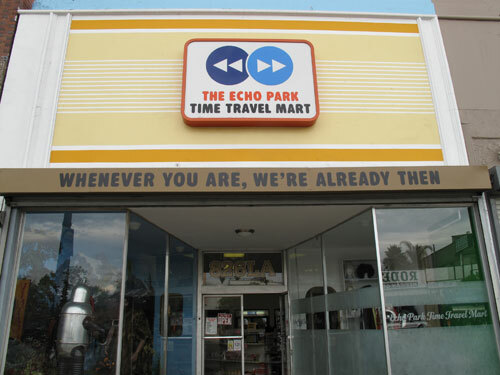 In the Echo Park neighborhood of Los Angeles, there is a Time Travel Mart (a mini-mart for all your time travel needs). It’s behind this mini-mart where I’m getting involved as a volunteer and working to get kids inspired about writing and storytelling. Mostly, I’ve worked with kids six and seven years old in the Storytelling and Bookmaking field trips. What 826 has designed for these field trips is truly a bit of genius. The kids are told that they are visiting “Barnacle & Barnacle publishers, run by Mr. and Mrs. Barnacle, and thank goodness Mr. Barnacle isn’t in the office today, because he is the meanest boss in the world.” Lo and behold, partway into introductions, Mr. Barnacle’s grumpy voice breaks in over a loud speaker and the pressure is then on to create as many original stories as there are kids in the room, in order to please Mr. Barnacle and keep the lowly Barnacle & Barnacle employees from losing their jobs. So if there are 20 kids in the room, how will they get 20 original stories? They all write 3 pages as a group (with some help from a “grownup” or two), bringing the story to a cliffhanger, and then each of them writes their own version of page 4, creating 20 unique endings. My friend Eric Layer pictured here at far left, co-leading an 826 field trip. That’s not the whole story, however, and this is where I come in. While they are writing each of their first three pages as a group, I am illustrating those pages — live. I have to time my drawing so that I have just enough information to create an image and have it done by the time they finish their page. It goes pretty quickly and sometimes elements of the story change halfway through a page, so I have to keep my ears wide open while I’m working. After they’ve finished their own endings (which myself and the other volunteers and staff help out with), they have lunch. By the time they’re done with lunch, their books are printed and bound, illustrations included, each student receiving a copy with their own unique ending and their author picture on the back cover. Like magic! 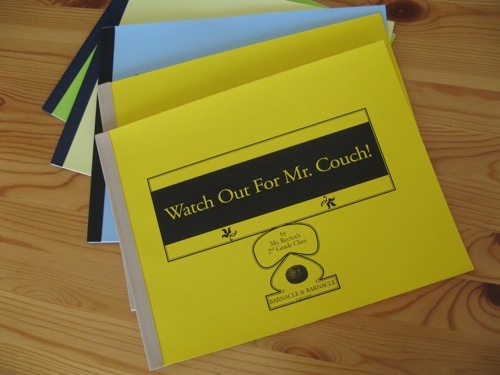 A section of "Watch Out For Mr. 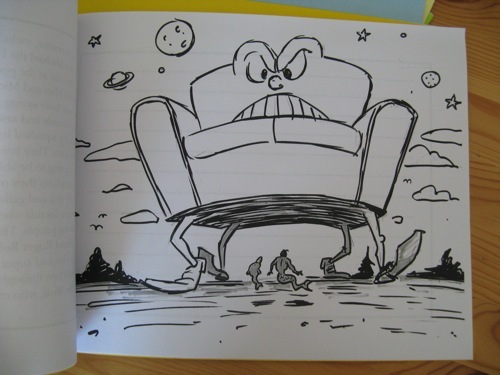 Couch!" 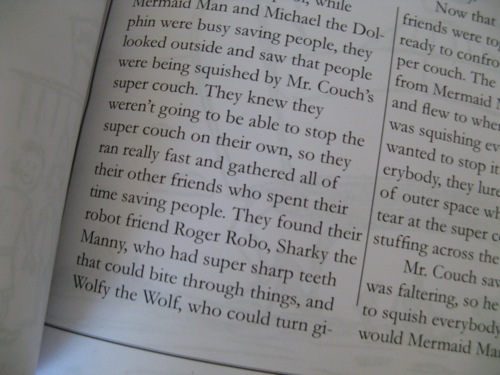 Mermaid Man and his sidekick Michael the Dolphin confront the evil Mr. Couch's super couch in "Watch Out For Mr. Couch!" 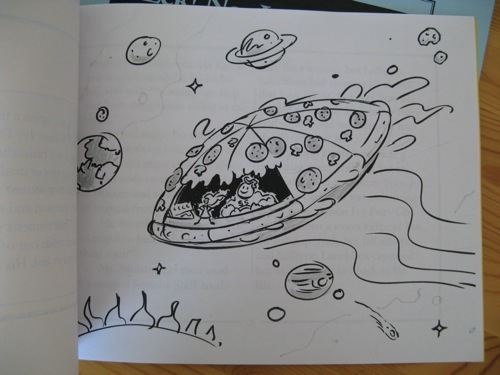 Mr. Squishyman and Poison Ivy Fairy Girl fly through space in their flying saucer made of pizza in "The Adventures of Mr. Squishyman and Poison Ivy Fairy Girl and the Wicked Lollipop Lunchbox." 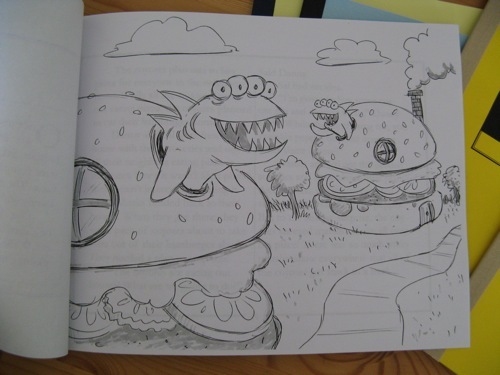 Alien shark brothers Danny and Sal live in hamburger houses in "Shark vs. Coyotes: An Ice Cream Contest." 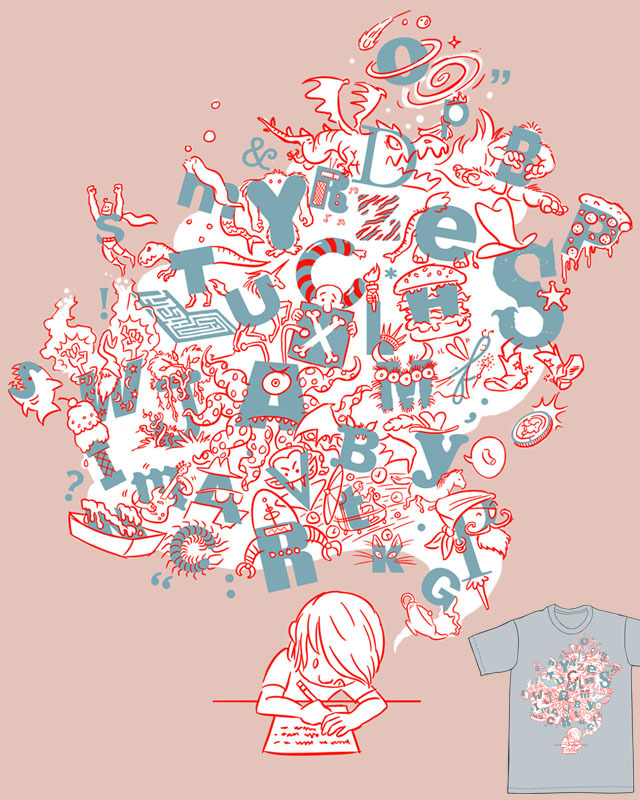 Many thanks to everyone who scored my tee-shirt design “The Write Stuff” on Threadless! It ended up with a fairly respectable 2.84 from 585 votes (I saw it get up to 2.88 at the highest point). And now the waiting period begins. 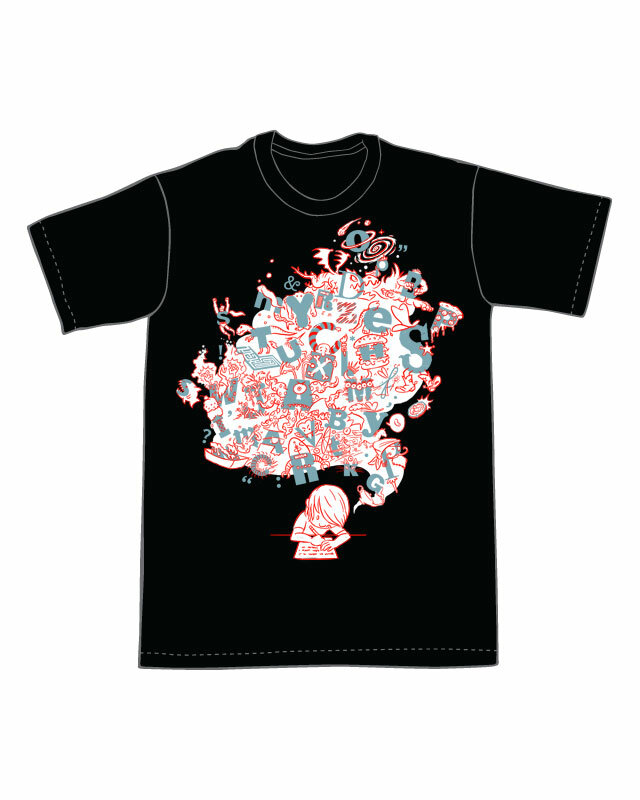 Judging by what I’ve seen on Threadless, it could be 2-3 months before it gets selected or… I could be faced with the unending deafening silence of never being printed — which is an equal possibility. So, we shall see. You can be sure that if/when it gets selected, I will begin another round of promotion to get everyone I know to buy it! In the meantime, the image can still be used for non-apparel. Having submitted my first design to Threadless has also been really positive, because it’s gotten me out of a sort of internet-rut, where I’ve shied away from putting myself out there. 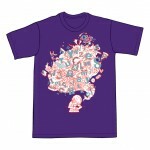 It’s inspired me to wonder, if I were to create more designs for Threadless, what would they be? And at least in a small way, it’s helped me revisit the potential of the internet for creative enterprise and as a source of motivation. 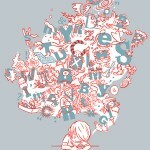 We are approaching the final hours to score my design “The Write Stuff” on Threadless! I’ve gotten some pretty positive responses on this design (including enthusiastic words from friends at 826 National) and it will be really exciting if this is selected for print, but I’m calling on everyone to give it that extra push it needs to really stand out by scoring it a FIVE (if you haven’t done so already). Don’t have a Threadless account? Sign up for free here. 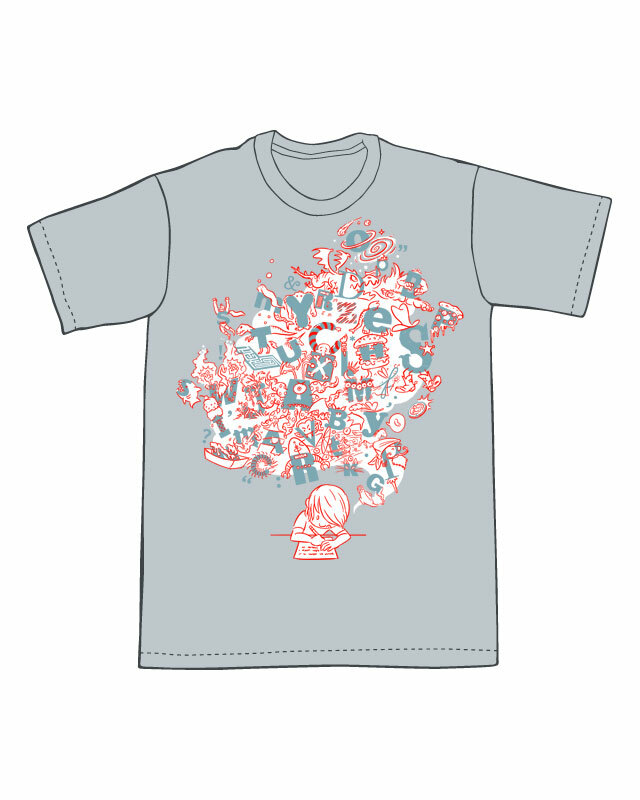 Just for fun, I’m posting a sketch from the “making of” and a couple images of the design against the Silver tee color, as well as some alternate colors of tees. 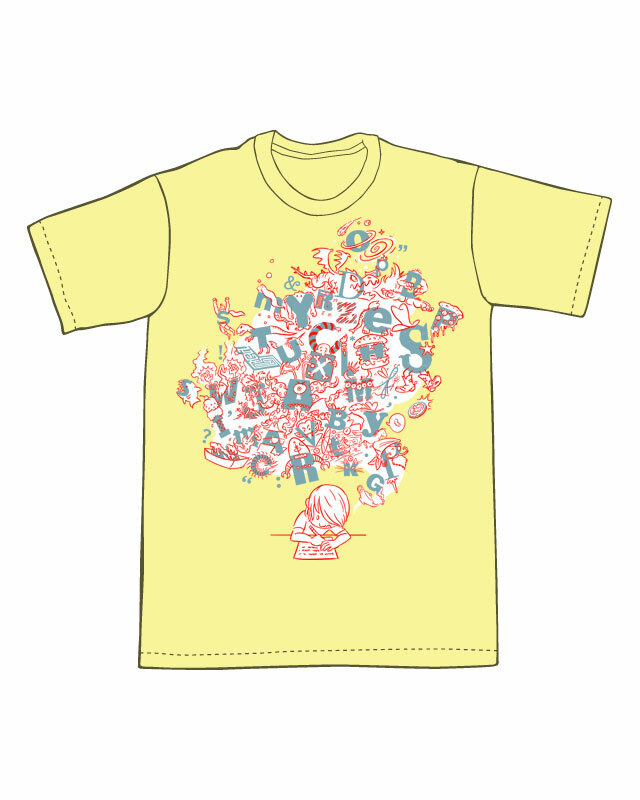 The colors of the design itself have not been altered here — just the shirt colors. Enjoy! You can check back over the next couple of days to see if it’s approved and available for scoring (I hope you will give it a 5). 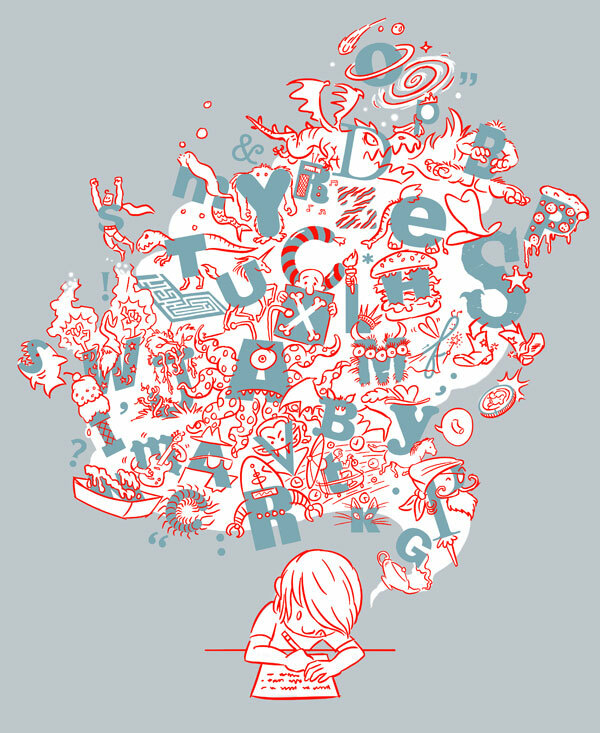 I originally intended this for Threadless’s challenge for 826 National, but the deadline was midnight last night (Monday) and I only just found out about the contest on Friday, with little time to work on it over the weekend. So… I missed the deadline by a few minutes. Nonetheless, I felt it was a solid design, so I submitted it to the general area of Threadless for scoring. Since the normal cash prize for having a design selected for print is higher than the one for the 826 challenge, should my design go to print, I’m pledging to donate a portion of the award to 826 for providing me with the inspiration. I’ve experienced the work that 826 National does firsthand, volunteering as a cartoonist for their Storytelling and Bookmaking field trips. It’s usually a class of first- or second-graders. 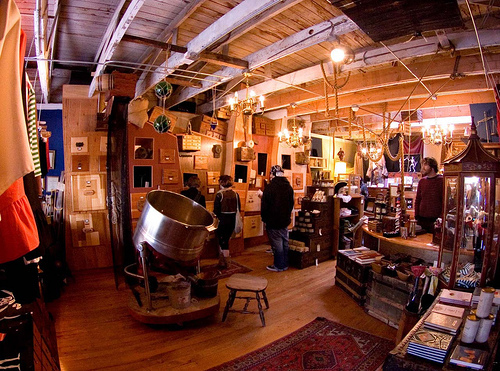 They come in to 826LA’s location in Echo Park, behind the Time Travel Mart, and they write a story. 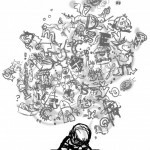 I illustrate it on the spot! 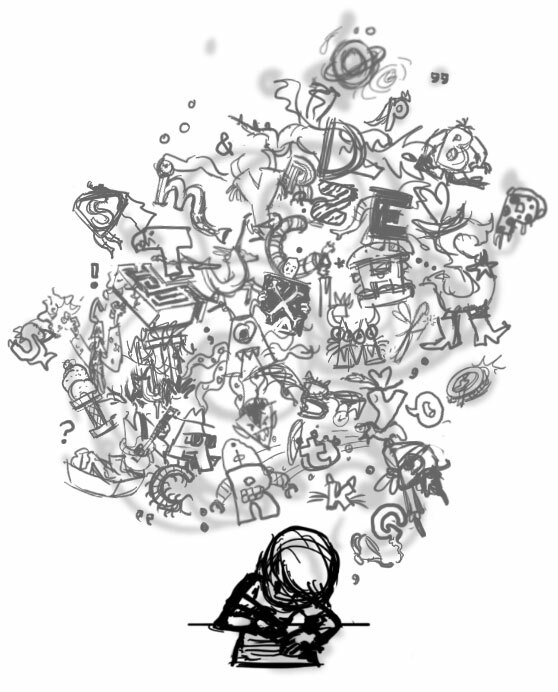 It’s given me some insight/reminder of the sorts of things that are bouncing around in their imaginations. 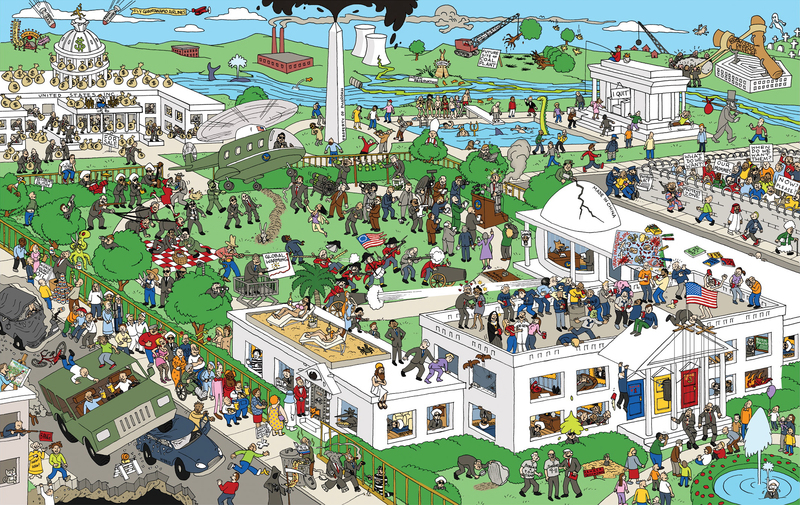 Here’s the final artwork for the previously-mentioned Where’s Waldo spoof “Where’s Osama?” I worked on in late 2007. I created this full spread illustration (set in Washington D.C.) and a cover design. 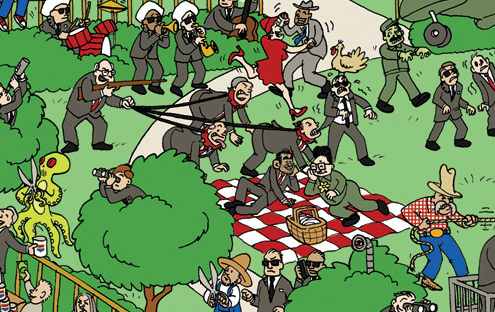 I gained a new respect for the Waldo books. It’s tricky coming up with this many gags orchestrated in a single image. This was the job that convinced me to buy a new computer and a Cintiq. I drew all of this in pen on a large sheet of paper and scanned it with a large drum scanner, then colored it in Photoshop at high resolution. Even with a simple color scheme, my G4 “Yikes!” (PowerMac G4, circa September 1999) was choking on it the whole way. 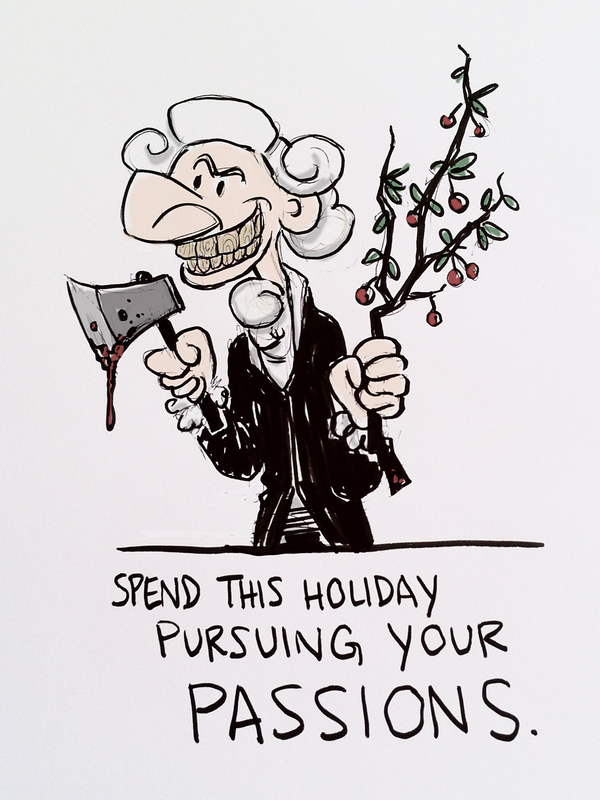 This was shopped around to see if there was any interest in putting out a whole book of these. Unfortunately it never made it past the first spread, but it had great potential. The meter may have been running on the topical humor, with Bush on his way out of office and the Presidential race underway for 2008, but I can think of several magazines that this image alone would’ve been perfect for. 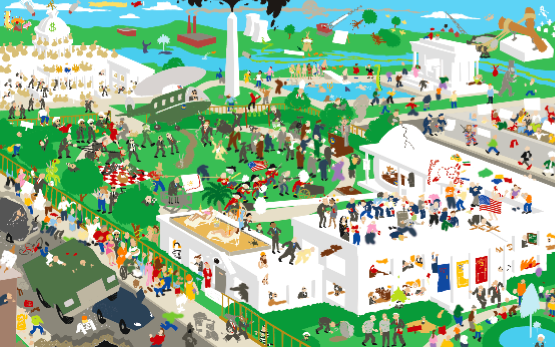 Brush up on your ‘08 Presidential race, click the image for a full size version, and see if you can spot all the gags, political players of the moment, and Osama bin Laden! Watch out for the undercover CIA agents in turbans. 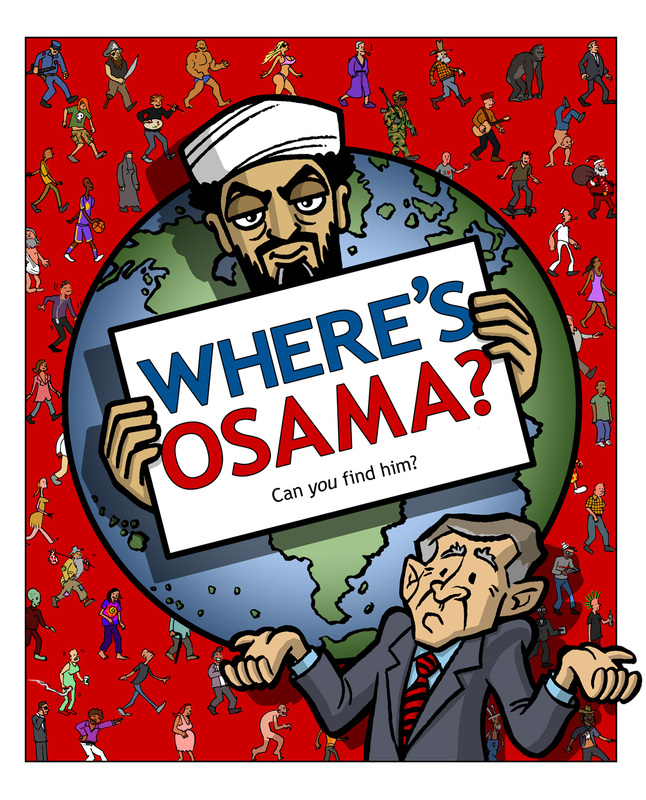 Recent events had me thinking about a book project I worked on in late 2007 called “Where’s Osama?” It was a concept for a Where’s Waldo spoof — various illustrated scenes within which the reader is invited to find Osama bin Laden. I completed one full spread illustration and a cover design. It was done on spec and proved to be a surprising lot of work. Unfortunately, the images are on an external drive that is having a hardware issue and can’t be accessed. I have just this one image of the coloring in progress and only at this low resolution. Gotta love technology. When I get the drive fixed, I’ll follow up with the real deal! For now, puzzle over this. Artist Jean Giraud, aka Moebius, in the United States for the first time in 15 years, discussed his life and work and ideas with animation director John Musker. The talk was slated to last 75 minutes, but it ran two hours, which was terrific! I could have kept listening for another hour, at least, but this was about perfect. At the end of the talk, he banged out a couple of drawings, projected onto two large screens (where we also viewed many samples of his work and video clips during the talk). 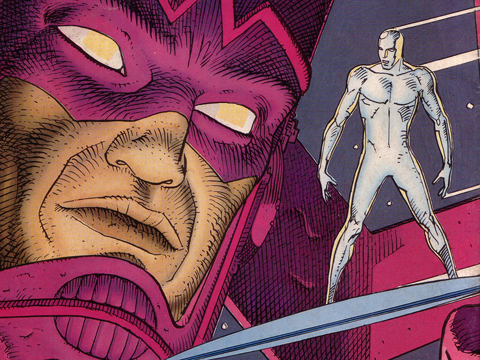 My exposure to Moebius began at about the age of twelve, when I bought a Silver Surfer comic book that he had collaborated on with Stan Lee. I have to admit, though I’ve seen many examples of his artwork over the years here and there, I really have not read much else of his work. But since that first glimpse with the Silver Surfer, he has always stuck in my mind as an exceptional draftsman, a masterful artist with an enigmatic quality to his work. His work breathes. It seems alive. This experience was very inspiring. I’m really excited to start reading some Blueberry and Arzach. Those of you who are visiting this site because I gave you one of my cards at the Expo, welcome! It was a pleasure meeting you and thanks for checking out the site. I will be adding some new posts soon to talk a little bit about what I’ve been up to lately and to show some samples of my work. Stay tuned! Secret of Kells Now Playing! I’ve just discovered that The Secret of Kells is screening in Los Angeles, San Francisco, New York, and other select cities. As Dave Letterman says, I just pray to God your city has been selected! 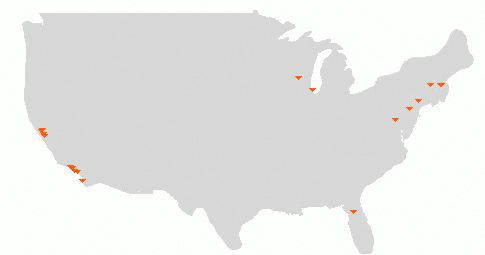 Here’s a U.S. map from IMDb, showing screening locations as of April 4th, 2010. Check your local listings and go see this lovely film! In Los Angeles, it is currently screening at The Landmark theater on Pico. This is a nice new theater with assigned seating. I personally prefer it over the Arclight in Hollywood, which is much-loved by many, but I find to be a bit of a clusterf**k. For some reason, however, local listings for The Landmark are often unreliable. Best to go directly to The Landmark site for times, tickets, and seat selections. In case you missed the link to the Berlinale Festival page in my previous post or didn’t happen to notice, there is a press conference video on that page from the premiere of Sylvain Chomet’s “The Illusionist” (original story by Jacques Tati). Click on “Press Conference” to start the video stream and skip ahead to 5:55 for the discussion. Most of it is spoken in English and those parts that aren’t have a live voice-over translation. Chomet talks about the origin of the project, correlations between Tati’s style of directing and directing for animation, possible advantages to producing the story a half-century after its conception, and the inspiration to set scenes in Scotland instead of Prague. If you’re anticipating this film as much as I am, this is definitely worth a viewing. 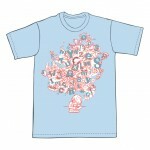 Again, here’s the link. 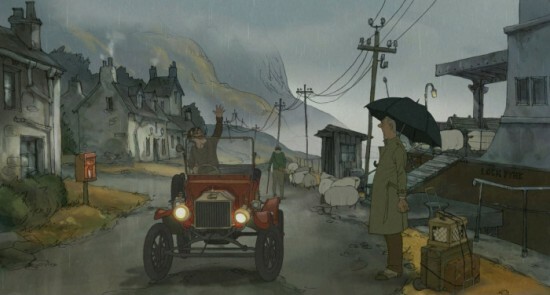 I’m excited about The Illusionist, the latest animated feature from Sylvain Chomet (Triplets of Belleville), adapted from an unproduced script written by filmmaker, comedic actor, mime, performer savant Jacques Tati in 1956. I first learned of this project about six months back when I discovered a new title in Chomet’s filmography on IMDb, listing Chomet and Tati as co-writers. I was struck with confusion and elation, and immediately looked for more information about the film, only to find a little more backstory on the origin. The script was in the possession of Tati’s daughter, Sophie Tatischeff, and she specifically chose Chomet to create the film adaptation. She expressed her preference that the iconic image of her father be portrayed and performed on the screen by way of animation, as opposed to live-action. I think she found a sublime match. As evidenced by its February screening at the Berlinale festival, the film is now complete and I’m antsy to see it arrive on screens in the United States. The stills and clips that are beginning to pop-up are intriguing. I would just like to give a quick report and say that the Academy’s Animated Feature Symposium was a great event. Wes Anderson was in London and couldn’t make it, but Henry Selick, John Musker, Ron Clements, Tomm Moore, and Pete Docter were all there. 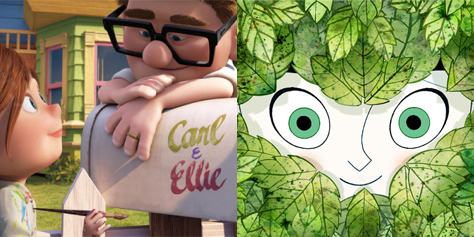 We saw clips from each of the films nominated for the Animated Feature Oscar for 2009 (2010 ceremony). I had already seen all the films, a few of them more than once, but it was a treat to see slices of them placed side-by-side on the big screen. It helped to remind me of each of their strengths. 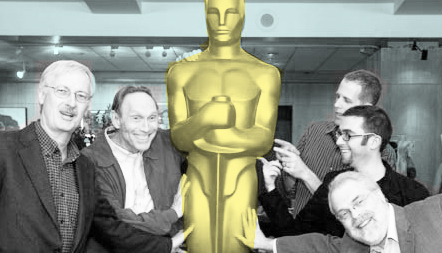 As of this writing, the Oscars ceremony has already ended and we know that Up was the winner. A big “up” to Pete Docter and the many tremendous artists and technicians that went into its production. Watching the clips from Up on Thursday night reminded me yet again, just what a delightful film this is. I honestly do not say that to be popular, though I realize I’m in good company. One of the clips that was shown at the symposium was the sequence that takes us from Carl and Ellie as little kids to the beginning of Carl’s life as an elderly widower. It is such a profoundly well-crafted piece of film making and of animation. Anyone who disagrees, I’m inclined to set them up for an appointment at the nearest radiologist to see if they still have a heart. However, I think perhaps the biggest winner in all of this is The Secret of Kells and its director Tomm Moore. I saw the film when it screened here as part of the Los Angeles Irish Film Festival and found it absolutely beautiful. Having visited Ireland for the first time only months prior and having had the opportunity to view the real Book of Kells in person certainly added a great deal to my experience of the film, as well. I’ve also had an appreciation for the Celtic Manuscripts since studying them in my college Art History class. But I think it makes an enjoyable film for anyone, regardless of their familiarity with Ireland or the Book of Kells. 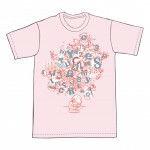 It is a visually rich and appealing experience. I loved the simplified, almost geometric designs tempered by fluid, expressive animation. I loved the warm-hearted, appealing characters. And I loved the playfulness with the picture plane and illusion of space. I do hope the nomination of The Secret of Kells brings it much-deserved attention and I hope we can get some more screenings of it in those big dark rooms we call theaters. I have a great deal of admiration for all the directors who participated in the Symposium (and also for Wes Anderson). Henry Selick is a madman and a genius, whose happiest place is in the middle of production. When posed the first question of how the Coraline project began, he was quick to point out that someone (Neil Gaiman) actually looked in the credits of a Nightmare Before Christmas and saw that it was not directed by Tim Burton. John Musker and Ron Clements made a comic duo as they jokingly bickered about whether or not they bickered as co-directors. I could go on, but I’ll try to cut this short. I’ll just say that it was a pleasure getting to see all of these guys together in person. Listening to their stories, perspectives, advice, opinions, etc., was inspiring. Thanks to the Academy for organizing events like this one and making them available to the public. …sounds like a bizarro law firm. I’ll be attending this event Thursday evening, March 4th 2010, at the Sam Goldwyn Theater in Beverly Hills. Schedules permitting, these guys (pictured below) will be there to talk about the big movies they made that are up for Oscars this weekend. Tickets can be purchased here for the low low low price of $5, but don’t wait. it’s sure to be a hot ticket. If you see me there, please feel free to say hello. 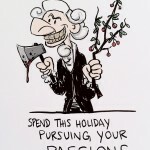 In my previous post, I focused somewhat on the drawing, which I do think is great and the above image is a terrific example, but how about the comedy! 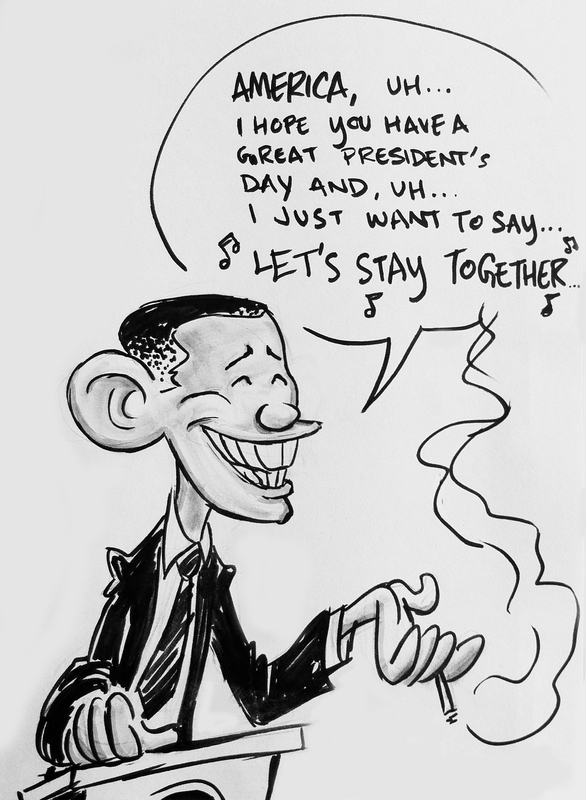 The drawing really sells the joke with composition, expression, staging, environment, etc., and all that stuff that contributes to the tone, but if you just strip it down to the basic joke, it’s still a great cartoon and that’s really his genius, I think. 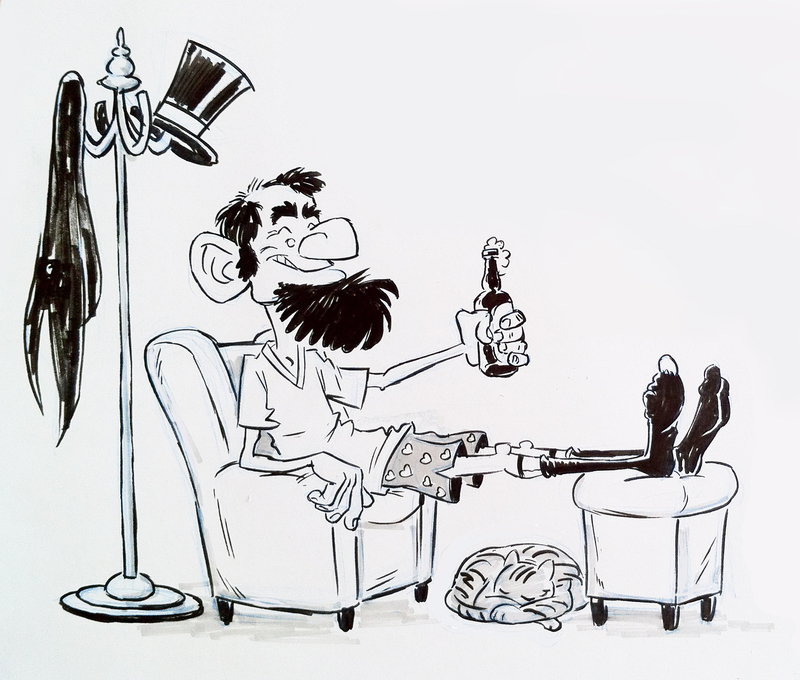 Many of his cartoons don’t really make light of a bad situation, so much as they find the comedy amidst a miserable situation. It could also be said that some of the jokes are really low-brow… but they are played so smartly. There is a real joy in that sort of humor. Why is it I never heard of this guy before? 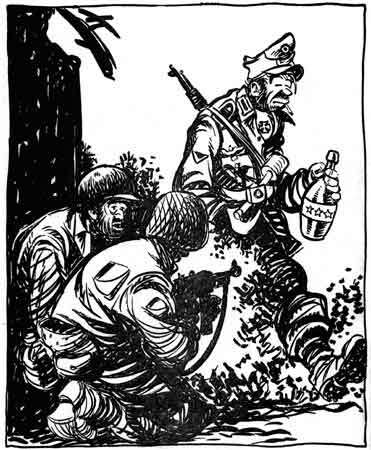 I’m seeing a strong stylistic resemblance to Will Eisner, who I also love. Check out the expressive lines. When I see how a squiggly line can just so perfectly describe something. It blows my mind. 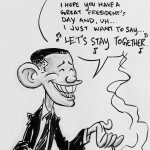 I love the rhythmic flow throughout and the mix of realism and caricature/cartoon — a mix of the tragic and the comic. Really fun stuff. I like his approach to the subject matter, too. I’m not big into war stories, per se, but I get the feeling that doesn’t matter in this case. He’s getting to the humanity of things — not glorifying the military industrial complex — and he was there. This isn’t some fantasy fan-boy stuff. 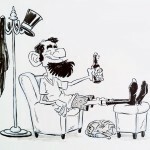 He was cartooning about his own reality and of those around him. His honesty landed him a reprimanding or two from General Patton himself. 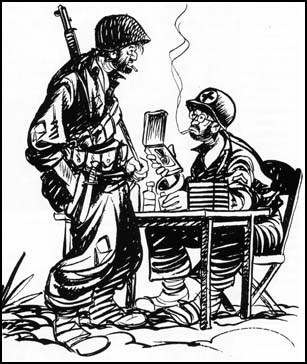 Reading about Bill Mauldin here, here, and here. I’m going to enjoy looking into this further.